According to Henry's Law, at a constant temperature the amount of a gas dissolved in a solvent is directly proportional to its partial pressure when it is in equilibrium with its liquid phase. When an ionic solid dissolves, ions leave the solid and become dispersed in the solvent. This solution can be classified as saturated, unsaturated or supersaturated. Concept #1: Saturated, Unsaturated and Supersaturated Solutions. Welcome back, guys! In this new video, we're going to take a closer look at solubility. What we should realize is that solubility can have two other names associated with it. Solubility is also called concentration. If they say concentration, it's the same thing as solubility. Another name for concentration or solubility would be molarity. Molarity is moles of solute per liter of solution. Solubility is how much solute can we dissolve in our solvent. They're both basically saying the same exact thing. When we dissolve a solid, what's going to happen is ions are going to leave that solid and basically dissolve within the solvent. What we should realize is that there’s basically a threshold, a limit to how much solute we can dissolve into something. After a certain point, we can try and try and try and add more and more solid but none of it is going to dissolve because the water, the liquid, has reached its maximum amount of dissolving. We should realize that when it comes to this, there are different terms we need to be familiar with. We're going to say in a blank solution, the maximum amount of dissolved solute is present in the solvent. What I mean by this is let's say we have a bucket of water. Let’s say that this bucket of water can only dissolve up to 100 grams of solute. Let's say I take 102 grams of solute and I dump it into that bucket. The bucket will dissolve the hundred grams, no problem. But those extra two grams I have are not going to dissolve. They're going to remain as solids clumped up at the bottom of the bucket of water. We're going to say this solution has reached its maximum amount of solute. We're going to say that this solution is saturated. Remember, saturated means that the solution, the solvent, has reached its maximum amount in grams, in moles, whatever of the amount of solute it can dissolve successfully. In a blank solution, additional amounts of solute can be further dissolved in the solvent. We have our same bucket of water. We say that it can dissolve 100 grams. But let's say I take 90 grams of solute and I dump it in there. All 90 grams will completely dissolve and we still have room to dissolve 10 more grams. We're going to say that this solution is unsaturated. It still has room for it to dissolve more solvent. It will successfully dissolve the 90 but we still have room for 10 more. Finally, our last type we're going to say in this, in a blank solution more than the equilibrium concentration of solute has been dissolved. What this means is again I have my bucket of water and somehow I get this bucket even though it's supposed to only dissolve 100, I get it to dissolve those extra 2 grams I talked about earlier. We're going to say that this solution is supersaturated. It's gone beyond its limit. You might ask, how do we accomplish this? What you’re going to say here is to do this, you’d have to apply heat. Heat is needed to do this. If you supply heat to it, you'll be able to dissolve beyond your maximum. But here's the thing. Supersaturated solutions are very unstable. The moment that I take away the heat from the solution, the extra 2 that I dissolved is going to re-solidify and form a precipitate or what we call a solid on the bottom. Remember, heat causes us to create a supersaturated solution. I can dissolve 102 grams, all 102 of it dissolves completely. Once I take away my heat, the extra 2 grams that I have here are going to form a precipitate. They're going to what we say recrystallize. They’re going to recrystallize at the bottom of my bucket of water. Saturated, unsaturated, supersaturated – all of them deal with solubility, how much solute can I dissolve. All of them deal with molarity. Remember, solubility, concentration, molarity – all the same thing. In a hypothetical solution 100 mL of water can dissolve up to 100 g of solute. In a SATURATED solution the water has reached its maximum amount of dissolve solute. In an UNSATURATED solution additional amounts of solute can be further dissolved in the solvent. In a SUPERSATURATED solution the solvent has dissolved beyond its maximum solubility. Example #1: Caffeine is about 10 times as soluble in warm water as in cold water. A student puts a hot-water extract caffeine into an ice bath, and some caffeine crystallizes. What is the identity of the solution before it’s been placed in an ice bath? d) Not enough information to answer the question. Connected to this is what we call Henry's law. Basically, Henry's law talks about how much gas can we get to dissolve in a solvent. 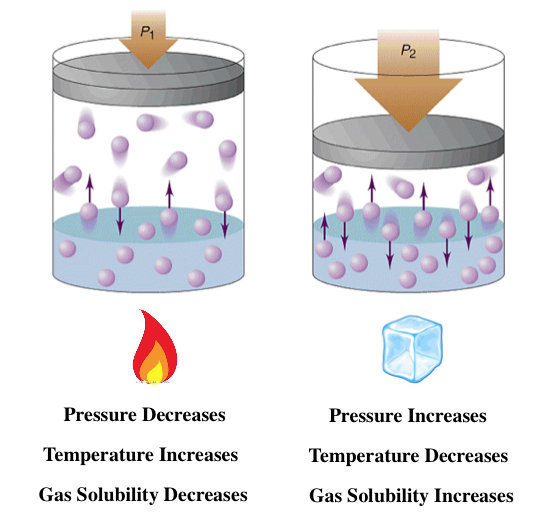 Henry’s law explains the relationship between gas, pressure, and solubility. The solubility of a gas, and remember solubility just means molarity, is directly proportional to the partial pressure of the gas above the solution. All this means is if I increase my pressure, then I increase the solubility of my gas. Because you have to think about in this way. We have a couple of water or something, a bucket of water and we have gas particles above it, floating on top of it. Here, this represents my pressure. If I push down on this piston, it’s going to push down against the gas. The gases have only one place to go. The gases will go into the liquid. The gas is dissolved in the liquid. That's what we mean by Henry's law. Basically if I increase my pressure, I increase how much gas I have in my solvent because they have no other place to go from pushing down on them. We're going to say again, solubility of the gas means molarity of the gas. P here, P of the gas means the partial pressure of that gas. Partial pressure of that gas just means that’s the pressure of only that gas. In a container, we usually don't have one type of gas. We usually have a mixture of gases. Collectively, that is the total pressure. But each type with gas has its own individual pressure. That individual pressure is called partial pressure. Then we're going to say kH here is known as Henry's constant. Together, all three of these give us Henry's law. Remember what solubility is and remember, increasing the pressure will increase the solubility of a gas. Henry's Law relates the solubility of a gas over a solution based on the factors of temperature, volume and pressure. Example #2: Henry’s Law Constant for nitrogen in water is 1.67 x 10-4 M•atm-1. If a closed canister contains 113 ppb nitrogen, what would be its pressure in atm? As the temperature of the solution increases more and more gas molecules will exit the solvent. Practice: In general, as the temperature increases, the solubility of gas in a given liquid ________________, and the solubility of most solids in a given liquid ________________. Practice: At a partial pressure of acetylene 1.35 atm, 1.21 moles of it dissolves in 1.05 L of acetonitrile. If the partial pressure of acetylene in acetone is increased to 12.0 atm, then what is its solubility? The "fizz" in a carbonated beverage is from carbon dioxide that has been dissolved in the aqueous solution. This is typically achieved by pressuring the "head space" (the empty space above the liquid in the bottle) with carbon dioxide gas. a. What is the concentration of CO 2 in a soda that has been pressurized with 3.0 atm of CO 2 (in molarity)? Assume a Henry's law constant of 0.0769 M/atm. b. How does the solubility of CO 2 in water change after it is opened and is at equilibrium with the air (i.e. does it become more or less soluble)? Why is it that the contents of a bottle of soda opened at room temperature tend to expand all over the persons hand’s holding the bottle, but the same bottle if opened when chilled just makes a slight hissing sound? 1. The carbon dioxide gas intentionally dissolved in the soda is more soluble at lower temperatures. 2. The bottle allows more gas to expand through the pores of the plastic at lower temperatures. 3. The bottle shrinks at low temperatures, creating less headspace for the gas above the soda, which means more gas dissolves in it, so less escapes when the bottle is opened. 4. The nitrogen gas intentionally dissolved in the soda is more soluble at lower temperatures. Fish breathe the dissolved air in water through their gills. Assuming the partial pressures of N2 and O2 in air to be 0.80 atm and 0.20 atm, respectively, calculate the concentrations of oxygen and nitrogen in water at 298 K. Henry’s law constant for N2 (g) and O2 (g) in water at 298 K are 6.8 x 10-4 and 1.3 x 10-3 mol L-1 atm-1, respectively. Identify the TRUE statement describing trends in solubility. a. Increasing the temperature of a solution increases the solubility of gases in solution. b. Increasing the partial pressure of a gas above solution decreases the solubility of the gas in solution. c. The solubility of a gas in a solution increases as its molar mass increases. d. The solubility of most solids in solution increases as the pressure increases. The solubility of CO2 in water at 25 °C and 1 atm is 0.034 mol/L. What is its solubility under atmospheric conditions where the partial pressure of CO2 is 0.003 atm? Recently, I was given laughing gas (N 2O, MW = 44.013 g/mol) during some dental work. They did this by applying a tube over my nose and flowing N2O into the tube, increasing the partial pressure of N2O to 0.4 atm. If the concentration of N2O in my blood after the dental procedure was 1.25 x 10-3 M, calculate the Henry's law constant for N2O. Coca-Cola took a public relations hit a few months ago when it was discovered that their “scientists” stated that obesity was due to insufficient exercise and not sugary soft drinks (New York Times, August 9, 2015). The partial pressure of carbon dioxide in the headspace of bottled Coke (the space above the liquid) is 3-4 atm, so let’s assume 3.5 atm. The Henry’s law constant for CO2(g) at 20°C is 3.91 x 10-2 mol/L∙atm. Calculate the solubility (mol/L) of carbon dioxide in water at 20°C. A mixture of gases contains 7.5 g H 2 and 29.6 g N 2 with a total pressure of 525 torr. Calculate the solubility of nitrogen gas if its Henry’s constant is 6.1 x 10 –4 M/atm. In deep sea diving, nitrogen is dissolved in the bloodstream under the high pressure. This leads to the condition known as “the bends.” Actually, nitrogen is much more soluble in fatty tissue than it is aqueous solutions (e.g. blood), and the nitrogen dissolved in the brain at a higher pressure can be a great concern for divers. The Henry’s law constant for N2(g) in fatty tissue is around 2 x 10-3 mol/L•atm at 25°C (as opposed to 6.8 x 10-4 mol/L•atm in water at that same temperature). Calculate the concentration of N2(g) in fatty tissue if the air pressure is 2.5 atm (that would correspond to a depth of about 50 feet). Remember the air is roughly 79% nitrogen. How does the solubility of a gas in a liquid depend on temperature? How does this temperature dependence affect the amount of oxygen available for fish and other aquatic animals? How does the solubility of a gas in a liquid depend on pressure? How does this pressure dependence account for the bubbling that occurs upon opening a can of soda? What effect does increasing temperature have on the solubility of gas in water? What effect does increasing pressure have on the solubility of gas in water? What effect does increasing temperature have on the solubility of a solid in water? What effect does increasing pressure have on the solubility of a solid in water? Scuba divers breathing air at increased pressure can suffer from nitrogen narcosis - a condition resembling drunkenness - when the partial pressure of nitrogen exceeds about 4 atm. What property of gas/water solutions causes this to happen? How could the diver reverse this effect? Scuba divers breathing air at increased pressure can suffer from oxygen toxicity - too much oxygen in their bloodstream - when the partial pressure of oxygen exceeds about 1.4 atm. What happens to the amount of oxygen in a divers bloodstream when he or she breathes oxygen at elevated pressures? How can this be reversed? The solubility of a gas in water is directly proportional to the partial pressure of the gas. The solubilities are in millimoles per liter of solution.How do the slopes of the lines vary with the molecular weight of the gas? The solubility of a gas in water is directly proportional to the partial pressure of the gas. The solubilities are in millimoles per liter of solution.Explain the trend. Solubilities of four gases in water as a function of temperature. The solubilities are in millimoles per liter of solution, for a constant total pressure of 1 atm in the gas phase.Where would you expect N2 to fit on this graph? You take a sample of water that is at room temperature and in contact with air and put it under a vacuum. Right away, you see bubbles leave the water, but after a little while, the bubbles stop. As you keep applying the vacuum, more bubbles appear. A friend tells you that the first bubbles were water vapor, and the low pressure had reduced the boiling point of water, causing the water to boil. Another friend tells you that the first bubbles were gas molecules from the air (oxygen, nitrogen, and so forth) that were dissolved in the water.Which friend is mostly likely to be correct? You take a sample of water that is at room temperature and in contact with air and put it under a vacuum. Right away, you see bubbles leave the water, but after a little while, the bubbles stop. As you keep applying the vacuum, more bubbles appear. A friend tells you that the first bubbles were water vapor, and the low pressure had reduced the boiling point of water, causing the water to boil. Another friend tells you that the first bubbles were gas molecules from the air (oxygen, nitrogen, and so forth) that were dissolved in the water.What, then, is responsible for the second batch of bubbles? Calculate the mass of nitrogen dissolved at room temperature in an 88.0 L home aquarium. Assume a total pressure of 1.0 atm and a mole fraction for nitrogen of 0.78. Fluorocarbons (compounds that contain both carbon and fluorine) were, until recently, used as refrigerants. The compounds listed in the following table are all gases at 25 oC, and their solubilities in water at 25 oC and 1 atm fluorocarbon pressure are given as mass percentages. Fluorocarbon Solubility (mass %) CF4 0.0015 CClF3 0.009 CCl2F2 0.028 CHClF2 0.30 Infants born with severe respiratory problems are sometimes given liquid ventilation: They breathe a liquid that can dissolve more oxygen than air can hold. One of these liquids is a fluorinated compound, CF3(CF2)7Br. The solubility of oxygen in this liquid is 66 mL O2 per 100 mL liquid. In contrast, air is 21 % oxygen by volume. Calculate the moles of O2 present in an infants lungs (volume: 15.5 mL ) if the infant takes a full breath of air. Assume a pressure of 1 atm in the lungs. Fluorocarbons (compounds that contain both carbon and fluorine) were, until recently, used as refrigerants. The compounds listed in the following table are all gases at 25 oC, and their solubilities in water at 25 oC and 1 atm fluorocarbon pressure are given as mass percentages. Fluorocarbon Solubility (mass %) CF4 0.0015 CClF3 0.009 CCl2F2 0.028 CHClF2 0.30 Using the information from part F, calculate the moles of O2 present in an infants lungs (volume: 15.5 mL ) if the infant takes a full "breath" of a saturated solution of O2 in the fluorinated liquid. At ordinary body temperature (37 oC), the solubility of N2 in water at ordinary atmospheric pressure (1.0 atm) is 0.015 g/L. Air is approximately 78 mol % N2.Calculate the number of moles of N2 dissolved per liter of blood, assuming blood is a simple aqueous solution. At ordinary body temperature (37 oC), the solubility of N2 in water at ordinary atmospheric pressure (1.0 atm) is 0.015 g/L. Air is approximately 78 mol % N2.If a scuba diver suddenly surfaces from this depth, how many milliliters of N2 gas, in the form of tiny bubbles, are released into the bloodstream from each liter of blood? Effect of pressure on gas solubility. If the partial pressure of a gas over a solution is doubled, how has the concentration of gas in the solution changed after equilibrium is restored? The Henrys law constant for helium gas in water at 30 oC is 3.7 10 - 4 M/atm; the constant for N2 at 30 oC is 6.0 10 - 4 M/atm.If helium gas is present at 1.7 atm pressure, calculate the solubility of this gas. The Henrys law constant for helium gas in water at 30 oC is 3.7 10 - 4 M/atm; the constant for N2 at 30 oC is 6.0 10 - 4 M/atm.If N2 is present at 1.7 atm pressure, calculate the solubility of this gas. During a persons typical breathing cycle, the CO2 concentration in the expired air rises to a peak of 4.6% by volume.Calculate the partial pressure of the CO2 in the expired air at its peak, assuming 1 atm pressure and a body temperature of 37oC . The presence of the radioactive gas radon (Rn) in well water presents a possible health hazard in parts of the United States.Assuming that the solubility of radon in water with 1 atm pressure of the gas over the water at 30 oC is 7.27 10 - 3 M, what is the Henrys law constant for radon in water at this temperature? At ordinary body temperature (37 oC), the solubility of N2 in water at ordinary atmospheric pressure (1.0 atm) is 0.015 g/L. Air is approximately 78 mol % N2.At a depth of 100 ft in water, the external pressure is 4.0 atm. What is the solubility of N2 from air in blood at this pressure? The volume over the solution in the container is 123 mL . Calculate the partial pressure of the hydrogen gas in this volume at 25 oC, ignoring any solubility of the gas in the solution. At 298 K, the Henry's law constant for oxygen is 0.00130 M/atm. Air is 21.0% oxygen. a) At 298 K, what is the solubility of oxygen in water exposed to air at 1.00 atm? b) At 298 K, what is the solubility of oxygen in water exposed to air at 0.900 atm? c) If atmospheric pressure suddenly changes from 1.00 atm to 0.900 atm at 298 K, how much oxygen will be released from 4.10 L of water in an unsealed container? All carbonated beverages are bottled under pressure because____________________A) if the pressure is increased, the solubility of the gas will increase.B) this will avoid the external contamination during the storage process.C) if the pressure is increased, the solubility of the gas will decrease.D) the pressure is necessary to keep the gas above the solution.E) the temperature changes constantly but the gas will remain with the same solubility. A) What is the Henry's law constant for CO 2 at 20°C? B) What pressure is required to achieve a CO 2 concentration of 9.60 x 10 -2? C) At 1 atm, how many moles of CO2 are released by raising the temperature of 1 liter of water from 20∘C to 25∘C? What is Henry's law? For what kinds of calculations is Henry's law useful? You may want to reference (Pages 532 - 538) Section 13.3 while completing this problem.Indicate whether each statement is true or false:(a) The higher the temperature, the more soluble most gases are in water. (b) The higher the temperature, the more soluble most ionic solids are in water. (c) As you cool a saturated solution from high temperature to low temperature, solids start to crystallize out of solution if you achieve a supersaturated solution. (d) If you take a saturated solution and raise its temperature, you can (usually) add more solute and make the solution even more concentrated. You may want to reference (Pages 532 - 538) Section 13.1 while completing this problem.Which two statements about gas mixtures are true? (a) Gases always mix with other gases because the gas particles are too far apart to feel significant intermolecular attractions or repulsions. (b) Just like water and oil don’t mix in the liquid phase, two gases can be immiscible and not mix in the gas phase. (c) If you cool a gaseous mixture, you will liquefy all the gases at the same temperature. (d) Gases mix in all proportions in part because the entropy of the system increases upon doing so. You may want to reference (Pages 539 - 541) Section 13.4 while completing this problem.Indicate whether each statement is true or false:(a) If you compare the solubility of a gas in water at two different temperatures, you find the gas is more soluble at the lower temperature. (b) The solubility of most ionic solids in water decreases as the temperature of the solution increases. (c) The solubility of most gases in water decreases as the temperature increases because water is breaking its hydrogen bonding to the gas molecules as the temperature is raised. (d) Some ionic solids become less soluble in water as the temperature is raised. (a) How did the concentration of dissolved CO2 in the beverage change when the bottle was opened? Respiratory problems are treated with devices that deliver air with a higher partial pressure of O2 than normal air. Why? Use atomic properties to explain why xenon is 11 times as soluble as helium in water at 0°C on a mole basis. Examine the Henry’s law constants in the table.Henry's Law Constants for Several Gases in Water at 25 oCGas kH (M/atm) O21.3 10-3N26.1 10-4CO23.4 10-2NH35.8 101He3.7 10-4Why is the constant for ammonia larger than the others? You may want to reference (Pages 532 - 538)Section 13.3 while completing this problem.You double the partial pressure of a gas over a liquid at constant temperature. Which of these statements is then true? (a) The Henry’s law constant is doubled. (b) The Henry’s law constant is decreased by half. (c) There are half as many gas molecules in the liquid. (d) There are twice as many gas molecules in the liquid. (e) There is no change in the number of gas molecules in the liquid. Although other solvents are available, dichloromethane (CH2Cl2) is still often used to “decaffeinate” drinks because the solubility of caffeine in CH2Cl2 is 8.35 times that in water. (a) A 100.0-mL sample of cola containing 10.0 mg of caffeine is extracted with 60.0 mL of CH2Cl2. What mass of caffeine remains in the aqueous phase? Although other solvents are available, dichloromethane (CH2Cl2) is still often used to “decaffeinate” drinks because the solubility of caffeine in CH2Cl2 is 8.35 times that in water. (b) A second identical cola sample is extracted with two successive 30.0-mL portions of CH2Cl2. What mass of caffeine remains in the aqueous phase after each extraction? Although other solvents are available, dichloromethane (CH2Cl2) is still often used to “decaffeinate” drinks because the solubility of caffeine in CH2Cl2 is 8.35 times that in water. (a) A 100.0-mL sample of cola containing 10.0 mg of caffeine is extracted with 60.0 mL of CH2Cl2. What mass of caffeine remains in the aqueous phase? (b) A second identical cola sample is extracted with two successive 30.0-mL portions of CH2Cl2. What mass of caffeine remains in the aqueous phase after each extraction? (c) Which approach extracts more caffeine? At 0 °C and 1.00 atm, as much as 0.70 g of O2 can dissolve in 1 L of water. At 0 °C and 4.00 atm, how many grams of O2 dissolve in 1 L of water? The Henry’s law constant (kH) for O2 in water at 20°C is 1.28×10–3 mol/L·atm. (a) How many grams of O2 will dissolve in 2.50 L of H2O that is in contact with pure O2 at 1.00 atm? The Henry’s law constant for O2 is 1.3 × 10−3 M/atm at 25 °C. What mass of oxygen would be dissolved in a 40-L aquarium at 25 °C, assuming an atmospheric pressure of 1.00 atm, and that the partial pressure of O2 is 0.21 atm? The Henry’s law constant (kH) for O2 in water at 20°C is 1.28×10–3 mol/L·atm. (b) How many grams of O2 will dissolve in 2.50 L of H2O that is in contact with air, where the partial pressure of O2 is 0.209 atm? Atmospheric CO2 levels have risen by nearly 20% over the past 40 years from 315 ppm to 380 ppm.What volume of CO2 at 25 oC and 1.0 atm is dissolved in a 21.0-L bucket of today's rainwater? The solubility of N2 in blood is a serious problem for divers breathing compressed air (78% N2 by volume) at depths greater than 50 ft.(c) Find the volume (in mL) of N2, measured at 25°C and 1.00 atm, released per liter of blood when a diver at a depth of 50. ft rises to the surface (kH for N2 in water at 25°C is 7.0×10−4 mol/L·atm and at 37°C is 6.2×10−4 mol/L·atm; assume d of water is 1.00 g/mL). A gas has a Henry's law constant of 0.151 M/atm. How much water would be needed to completely dissolve 1.66 L of the gas at a pressure of 7.30×102 torr and a temperature of 26 oC? Soft drinks are canned under 4 atm of CO2 and release CO2 when the can is opened. (a) How many moles of CO2 are dissolved in 355 mL of soda in a can before it is opened? Soft drinks are canned under 4 atm of CO2 and release CO2 when the can is opened. (a) How many moles of CO2 are dissolved in 355 mL of soda in a can before it is opened? (b) After the soda has gone flat? Soft drinks are canned under 4 atm of CO2 and release CO2 when the can is opened. (c) What volume (in L) would the released CO2 occupy at 1.00 atm and 25°C (kH for CO2 at 25°C is 3.3×10−2 mol/L·atm; PCO2 in air is 4×10−4 atm)? The small bubbles that form on the bottom of a water pot that is being heated (before boiling) are due to dissolved air coming out of solution. Use Henry's law and the solubilities given below to calculate the total volume of nitrogen and oxygen gas that should bubble out of 1.6 L of water upon warming from 25 oC to 50 oC. Assume that the water is initially saturated with nitrogen and oxygen gas at 25 oC and a total pressure of 1.0 atm. Assume that the gas bubbles out at a temperature of 50 oC. The solubility of oxygen gas at 50 oC is 27.8 mg/L at an oxygen pressure of 1.00 atm. The solubility of nitrogen gas at 50 oC is 14.6 mg/L at a nitrogen pressure of 1.00 atm. Assume that the air above the water contains an oxygen partial pressure of 0.21 atm and a nitrogen partial pressure of 0.78 atm. A sample of hydrogen gas is generated in a closed container by reacting 2.050 g of zinc metal with 15.0 mL of 1.00 M sulfuric acid. The volume over the solution in the container is 122 mL.The Henry's law constant for hydrogen in water at 25˚C is 7.8 x 10–4 mol/L-atm. Estimate the number of moles of hydrogen gas that remain dissolved in the solution. A sample of hydrogen gas is generated in a closed container by reacting 2.050 g of zinc metal with 15.0 mL of 1.00 M sulfuric acid. The volume over the solution in the container is 122 mL.The Henry's law constant for hydrogen in water at 25˚C is 7.8 x 10–4 mol/L-atm. What fraction of the gas molecules in the system is dissolved in the solution? A sample of hydrogen gas is generated in a closed container by reacting 2.050 g of zinc metal with 15.0 mL of 1.00 M sulfuric acid. Write the balanced equation for the reaction, and calculate the number of moles of hydrogen formed, assuming that the reaction is complete.The volume over the solution in the container is 122 mL. Calculate the partial pressure of the hydrogen gas in this volume at 25˚C, ignoring any solubility of the gas in the solution.The Henry's law constant for hydrogen in water at 25˚C is 7.8 x 10–4 mol/L-atm. What fraction of the gas molecules in the system is dissolved in the solution? Was it reasonable to ignore any dissolved hydrogen earlier? The release of volatile organic compounds into the atmosphere is regulated to limit ozone formation. In a laboratory simulation, 5% of the ethanol in a liquid detergent is released. Thus, a “down-the-drain” factor of 0.05 is used to estimate ethanol emissions from the detergent. The kH values for ethanol and 2-butoxyethanol (C4H9OCH2CH2OH) are 5×10−6 atm·m3 /mol and 1.6×10−6 atm·m3 /mol, respectively. (a) Estimate a “down-the-drain” factor for 2-butoxyethanol in the detergent. The release of volatile organic compounds into the atmosphere is regulated to limit ozone formation. In a laboratory simulation, 5% of the ethanol in a liquid detergent is released. Thus, a “down-the-drain” factor of 0.05 is used to estimate ethanol emissions from the detergent. The kH values for ethanol and 2-butoxyethanol (C4H9OCH2CH2OH) are 5×10−6 atm·m3 /mol and 1.6×10−6 atm·m3 /mol, respectively. (b) What is the kH for ethanol in units of L·atm/mol? The release of volatile organic compounds into the atmosphere is regulated to limit ozone formation. In a laboratory simulation, 5% of the ethanol in a liquid detergent is released. Thus, a “down-the-drain” factor of 0.05 is used to estimate ethanol emissions from the detergent. The kH values for ethanol and 2-butoxyethanol (C4H9OCH2CH2OH) are 5×10−6 atm·m3 /mol and 1.6×10−6 atm·m3 /mol, respectively. (c) Is the value found in part (b) consistent with a value given as 0.64 Pa·m3 /mol? In the “Méthode Champenoise,” grape juice is fermented in a wine bottle to produce sparkling wine. The reaction isC6H12O6 (aq) → (aq) 2C2H5OH (aq) + 2CO2 (g)Fermentation of 750. mL grape juice (density 5 1.0 g/cm3) is allowed to take place in a bottle with a total volume of 825 mL until 12% by volume is ethanol (C2H5OH). Assuming that the CO2 is insoluble in H2O (actually, a wrong assumption), what would be the pressure of CO2 inside the wine bottle at 25°C (The density of ethanol is 0.79 g/cm3. )The pressure of CO 2 in a bottle of sparkling wine was calculated assuming that the CO2 was insoluble in water. This was a bad assumption. Redo this problem by assuming that CO2 obeys Henry’s law. Use the data given in that problem to calculate the partial pressure of CO2 in the gas phase and the solubility of CO2 in the wine at 25˚C. The Henry’s law constant for CO2 is 3.1 x 10 22 mol/L • atm at 25˚C with Henry’s law in the form C = kP, where C is the concentration of the gas in mol/L. Suppose coal-fired power plants used water in scrubbers to remove SO2 from smokestack gases (see Chemical Connections, Section 6.6). (a) If the partial pressure of SO2 in the stack gases is 2.0×10−3 atm, what is the solubility of SO2 in the scrubber liquid (kH for SO2 in water is 1.23 mol/L·atm at 200.°C)? The following table presents the solubilities of several gases in water at 25 oC under a total pressure of gas and water vapor of 1 atm.Gas Solubility (m M)CH4 (methane)1.3C2H6 (ethane)1.8C2H4 (ethylene)4.7N20.6O21.2NO1.9H2S99SO21476What volume of CH4(g) under standard conditions of temperature and pressure is contained in 3.1 L of a saturated solution at 25 oC? The Henry’s law constant for CO2 is 3.4 × 10−2 M/atm at 25 °C. What pressure of carbon dioxide is needed to maintain a CO2 concentration of 0.10 M in a can of lemon-lime soda? To effectively stop polymerization, certain inhibitors require the presence of a small amount of O2. At equilibrium with 1 atm of air, the concentration of O2 dissolved in the monomer acrylic acid (CH2=CHCOOH) is 1.64×10−3 M.(a) What is kH (mol/L·atm) for O2 in acrylic acid? Argon makes up 0.93% by volume of air. Calculate its solubility (mol/L) in water at 20°C and 1.0 atm. The Henry’s law constant for Ar under these conditions is 1.5×10–3 mol/L·atm. To effectively stop polymerization, certain inhibitors require the presence of a small amount of O2. At equilibrium with 1 atm of air, the concentration of O2 dissolved in the monomer acrylic acid (CH2=CHCOOH) is 1.64×10−3 M.(b) If 0.005 atm of O2 is sufficient to stop polymerization, what is the molarity of O2? The partial pressure of CO2 gas above the liquid in a bottle of champagne at 20°C is 5.5 atm. What is the solubility of CO2 in champagne? Assume Henry’s law constant is the same for champagne as for water: at 20°C, kH = 3.7×10–2 mol/L·atm. Perfluorocarbons (PFCs), hydrocarbons with all H atoms replaced by F atoms, have very weak cohesive forces. One interesting consequence of this property is that a live mouse can breathe while submerged in O2-saturated PFCs. (a) At 298 K, perfluorohexane (C6F14, ℳ = 338 g/mol and d = 1.674 g/mL) in equilibrium with 101,325 Pa of O2 has a mole fraction of O2 of 4.28×10−3. What is kH in mol/L·atm? The solubility of nitrogen in water is 8.21 x 10-4 mol/L at 0°C when the N2 pressure above water is 0.790 atm. Calculate the Henry’s law constant for N2 in units of mol/L • atm for Henry’s law in the form C = kP, where C is the gas concentration in mol/L. Calculate the solubility of N2 in water when the partial pressure of nitrogen above water is 1.10 atm at 0°C. The solubility of N2 in blood is a serious problem for divers breathing compressed air (78% N2 by volume) at depths greater than 50 ft. (a) What is the molarity of N2 in blood at 1.00 atm? Calculate the solubility of O2 in water at a partial pressure of O2 of 120 torr at 25°C. The Henry’s law constant for O2 is 1.3 x 10-3 mol/L • atm for Henry’s law in the form C = kP, where C is the gas concentration (mol/L). The solubility of N2 in blood is a serious problem for divers breathing compressed air (78% N2 by volume) at depths greater than 50 ft.(b) What is the molarity of N2 in blood at a depth of 50. ft? A saturated solution was formed when 5.38×10−2 L of argon, at a pressure of 1.0 atm and temperature of 25 oC, was dissolved in 1.0 L of water. Calculate the Henry's law constant for argon. The partial pressure of O2 in air at sea level is 0.21 atm . The solubility of O2 in water at 20 oC , at 1 atm gas pressure, is 1.38 10-3 M (from Table 13.1 in your textbook).Using Henrys law and the data in the introduction, calculate the molar concentration of O2 in the surface water of a mountain lake saturated with air at 20 oC and an atmospheric pressure of 670 torr . The presence of the radioactive gas radon (Rn) in well water presents a possible health hazard in parts of the United States.A sample consisting of various gases contains 3.5 x 10–6 mole fraction of radon. This gas at a total pressure of 33 atm is shaken with water at 30˚C. Calculate the molar concentration of radon in the water. Use Henry's law to determine the molar solubility of helium at a pressure of 1.6 atm and 25 oC. Henry’s law constant for helium gas in water at 25 oC is 3.70 10-4 M/atm. A river is contaminated with 0.65 mg/L of dichloroethylene (C2H2Cl2). What is the concentration (in ng/L) of dichloroethylene at 21°C in the air breathed by a person swimming in the river (kH for C2H2Cl2 in water is 0.033 mol/L·atm)? Here are the solubilities of a particular solute at two different temperatures. Suppose that you have made a saturated solution of this solute using 53.0 g of water at 20.0 °C. How much more solute can you add if the temperature is increased to 30.0 C? At 20° C and a partial pressure of 760 mmHg the solubility of CO2 in water is 0.169 g/100 mL. What is the solubility of CO2 at 2.7 x 104 mmHg? Enter your answer in the provided box.Calculate the pressure of O2 necessary to generate an aqueous solution that is 4.9 x 10-2 M in O2 at 25°C. The Henry's law constant for O2 in water at 25°C is 1.3 x 10-3 mol/L atm. Calculate the solubility (in M units) of ammonia gas in water at 298 K and a partial pressure of 3.50 bar. The Henry's law constant for ammonia gas at 298 K is 58.0 M/atm and 1 bar = 0.9869 atm. Express your answer in molarity to three significant figures. Calculate the solubility of nitrogen in water at an atmospheric pressure of 0.41 atm (a typical value at high altitude). Use Henry's law to determine the molar solubility of helium at a pressure of 1.9 atm and 25°C. Henry's law constant for helium gas in water at 25°C is 3.70 x 10-4 M/atm. Express your answer using two significant figures. At 25°C and 765 Torr, carbon dioxide has a solubility of 0.0342 M in water. What is its solubility at 25°C and 1210 Torr?